To become a Merit Badge Counselor you must attend Merit Badge Counselor Training, have current youth protection training fill out an adult application, and a merit badge counselor application. 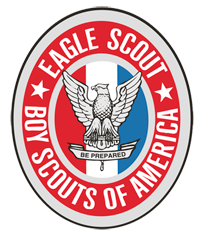 Mormon Trail District is proud of the many Eagle Scouts that come out of all our troops throughout the year; more than 50 boys earn the Eagle Scout Award in our district annually. Eagle Scout project approvals and Eagle Scout board of reviews will take place at your local geographic district roundtable. If you have any questions about Advancements or Eagle Scout Projects please contact Mormon Trail Advancement Chairman Gary Hunter. For more information about Advancements for all Ranks, please visit the Council's Advancement Page. There are two separate awards that Primary-age boys may earn. Requirements for both awards are in the Faith in God for Boys guidebook. Working on them at the same time will make it easier to complete the requirements for both. To earn the On My Honor Award, young men must (1) complete the requirements for the Duty to God certificate for deacons (or for another Duty to God certificate) and (2) achieve the Scout rank of Star in the United States, or equivalent Scouting award in other countries.